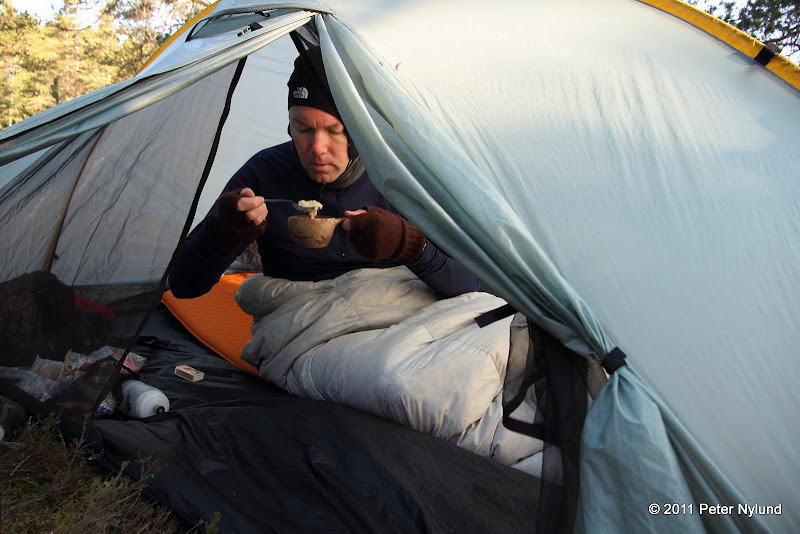 My first tent was a cheap ridge tent bought from a super market sometimes in latter half of the eighties. It was light, small and mostly kept the rain on the outside. Due to the singlewall construction and lack of proper ventilation it was very prone to condensation. 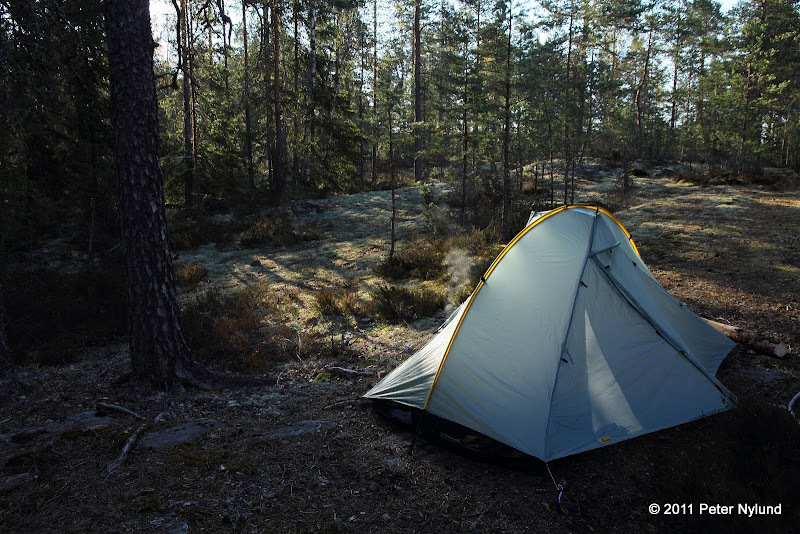 In the middle of the nineties I bought a three person Halti dome tent from Partiovaruste in Turku. It belonged to the Tunturihaukka series of gear specifically made for the scout shops in Finland. It was very much tent for the money. The weight was not entirely horrible, 2.8 kg, and it offered plenty of space for two persons, though it was slightly short for my 192 cm. The vestibule was small. The tent had fiber glass poles and was certainly not made to endure severe storms. Still, it served me well for a couple of years. 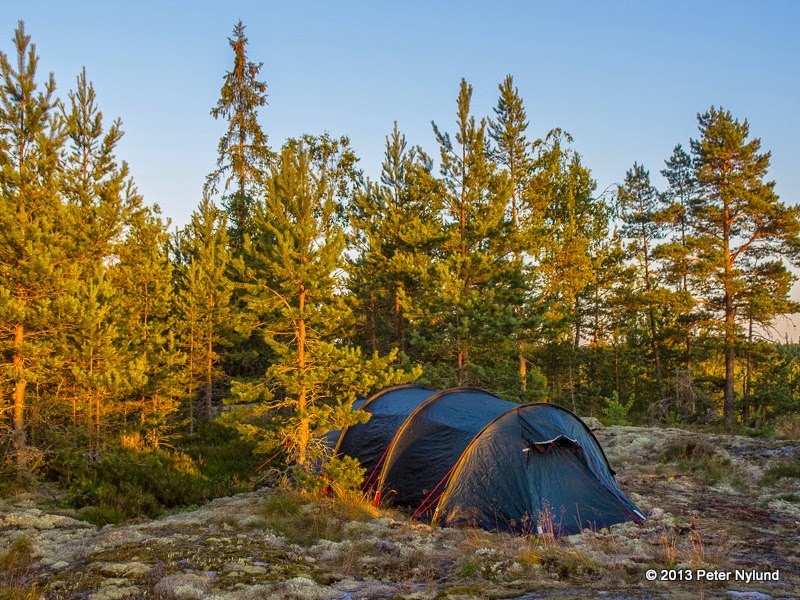 The next tent, a Hilleberg Nallo 3, was also bought locally from Partiovaruste. 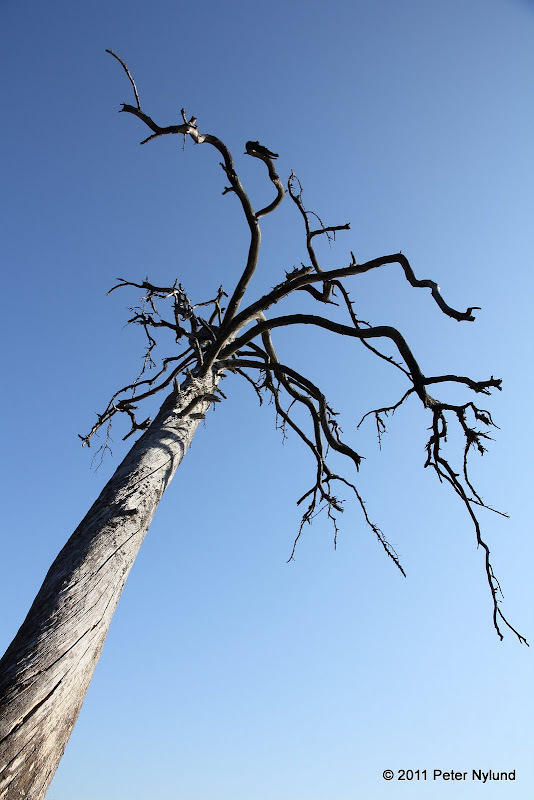 It was the old model with two equal length poles. 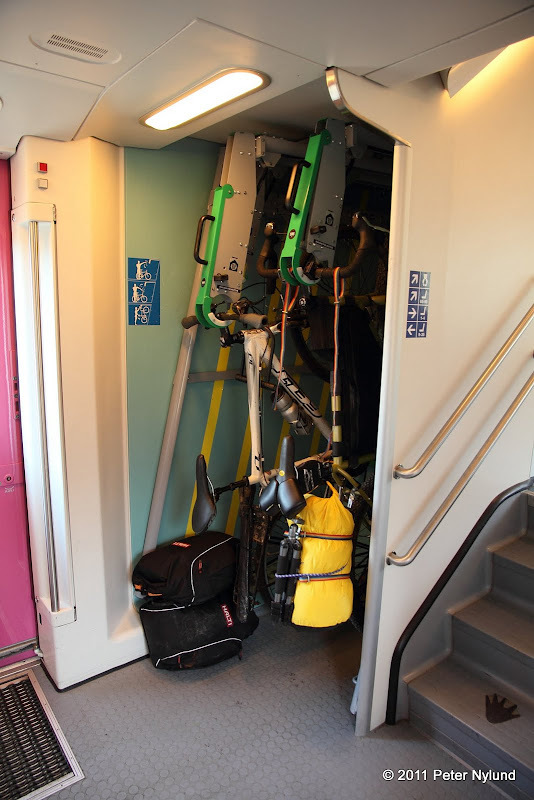 Again it had plenty of space for two persons and weighed 2.5 kg. It proved its worth in Lofoten when it rained continuously for five days and it was completely dry inside all the time. Like all tents of this type, it needed a little wind in order to avoid condensation. 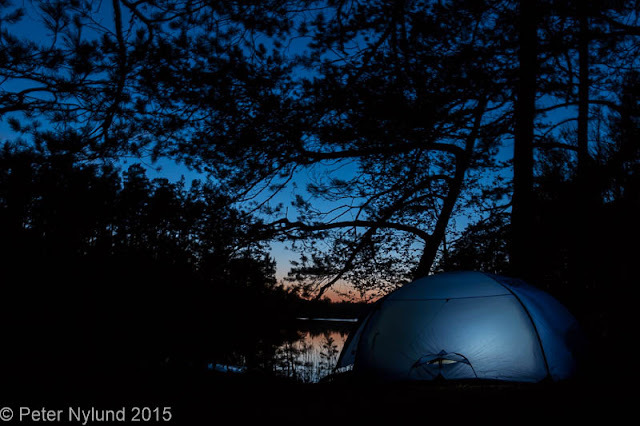 The details and usability of this tent showed the Hilleberg quality. I sold the tent when the family no longer consisted of only two persons. Now I definitely regret selling this one, but I needed the money at the time. For solo use I bought a Hilleberg Akto in 2002. It was the first model with the lighter material and highly placed vent. This tent also showed the Hilleberg attention to details and good solutions. It was big enough for me and at the time 1.5 kg for a fully storm proof four season solo tent was a good weight. 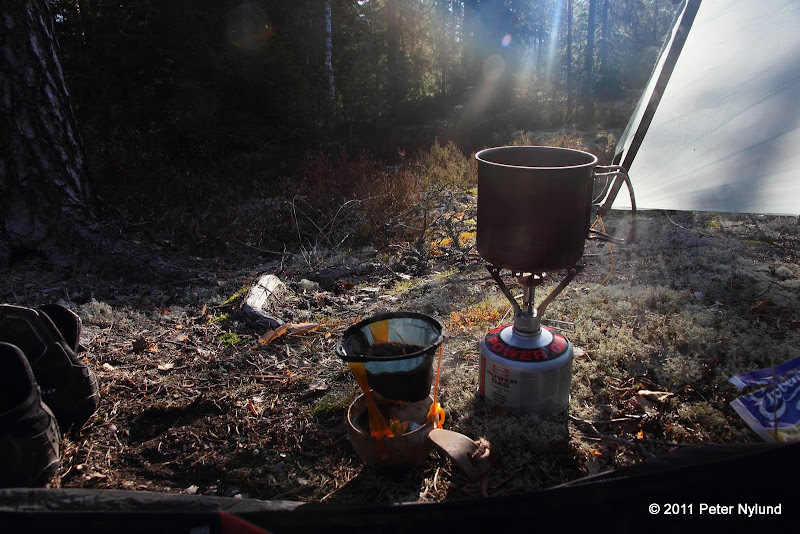 The Akto is an excellent tent if you spend a lot of time in exposed areas, but for forest trips it was much too enclosed. I sold it in 2010 when I wanted a lighter, roomier and more open shelter. After having sold the Akto tent I started looking for a replacement. I found a good solution in the Tarptent Double Rainbow. It was light, roomy and could be opened to provide good bug free views. A five year review of it can be found here. A couple of years ago I found a Partiovaruste special version of the Halti Alfa XPD 3 for a very good price (at Partiovaruste). The tent has the high quality outer tent of the ordinary Alfa XPD 3 and a cheaper inner tent from the ordinary Alfa tent. This is a three person tunnel tent with an extended vestibule and it should very storm proof due to the aerodynamic shape, top notch outer tent material and lots of guy lines. It has proved to be completely waterproof without any extra seam sealing. This tent weighs 3260 g, including 23 tent pegs and a heavy (110 g) stuffsack. 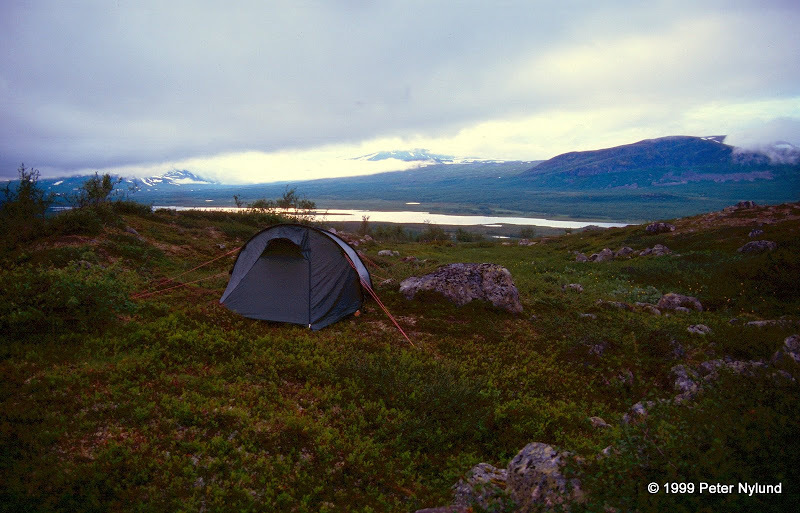 This was actually a very nice tent for the money, but I sold it when I got the Fjällräven Akka Dome 3 tent. Despite having the Alfa XPD 3 tent I still wanted something that could fit the entire family of two adults and two boys currently aged six and seven. Locally the Hilleberg Nallo 4 GT was available, and a weight of 3.4 kg for a very capable and roomy four season tent is not too bad. It is expensive, though. I also checked out other lightweight alternatives: The Big Agnes Copper Spur UL4 would be under 3 kg, but the inner first pitch is not really compatible with Nordic conditions. 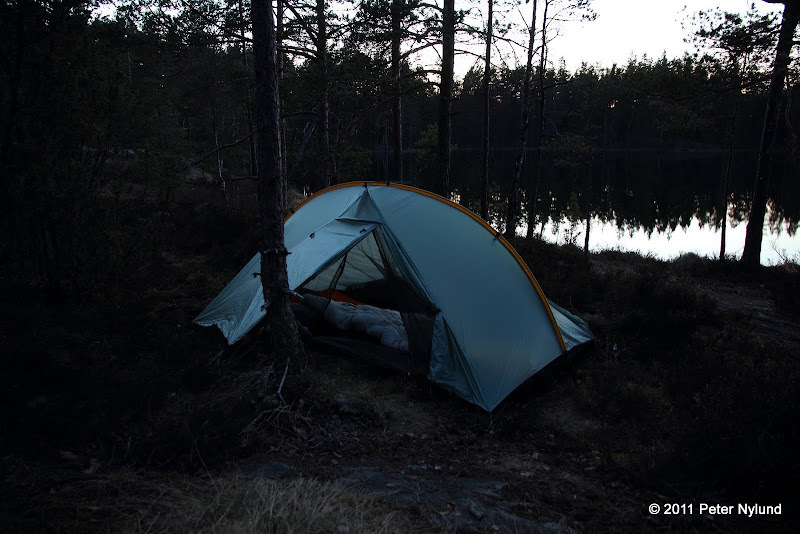 Tarptent Hogback sleeps four at the smallest possible footprint and 1.9 kg (! ), but does not seem that roomy inside. I finally chose the the Golite Shangri-La 5 with a bug inner tent, since it offered both modularity and a good amount of space for a fairly good weight while being very different from the Alfa XPD 3 tunnel tent. The Shangri-La 5 is a pyramid tent with a separate bug inner tent. The inner tent can be pitched afterwards inside the outer tent, a necessary feature since in rainy weather you want to keep them separated in the backpack to avoid getting the inner tent wet (been there, done that). It fits the entire family and feels very roomy inside due to the height. With the inner tent, there are two very long sleeping positions (lots of space left even for my 192 cm), one slightly shorter and one very short. Three long persons could also fit, but it is too small for four adults. The space does come at a cost: The footprint is big and will limit the available tent spots. 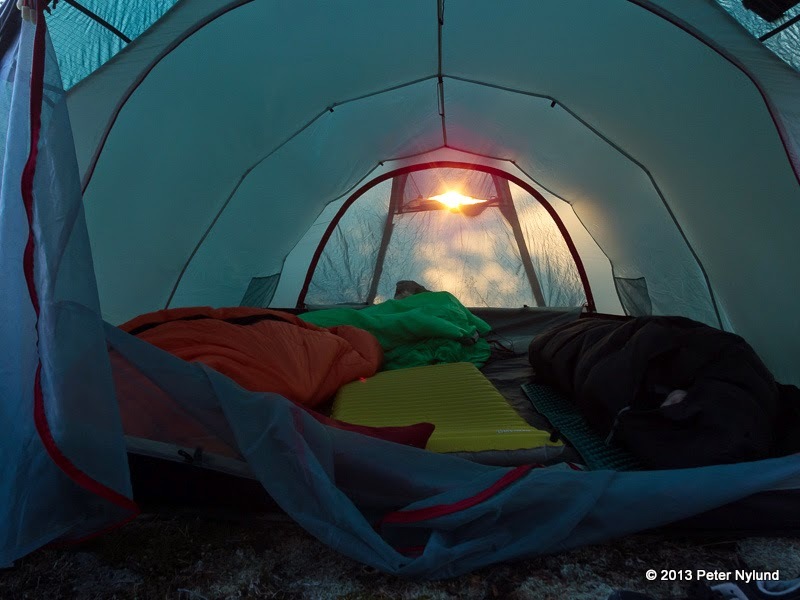 The first night with the Shangri-La was very promising: There was not a single drop of condensation anywhere, despite no wind and a temperature a few degrees above freezing. It remains to be seen how it performs in rain and heavy wind. Some reports show it to be very capable in high wind, though I think it needs to be staked down very good for that purpose. The Shangri-La 5 has taped seems, but I applied some extra sealant on a few places with more stitching. The weight was close to the specs: Outer tent with extra guylines 880 g, tent pole 350 g, inner tent 1325 g and the 8 standard pegs in a bag 94 g. With 4 extra large ground pegs it weighs 2.7 kg, which I think is ok for the space. Two light two person tents would be a lighter solution, but I think the social aspect of the bigger tent is more important for family use. 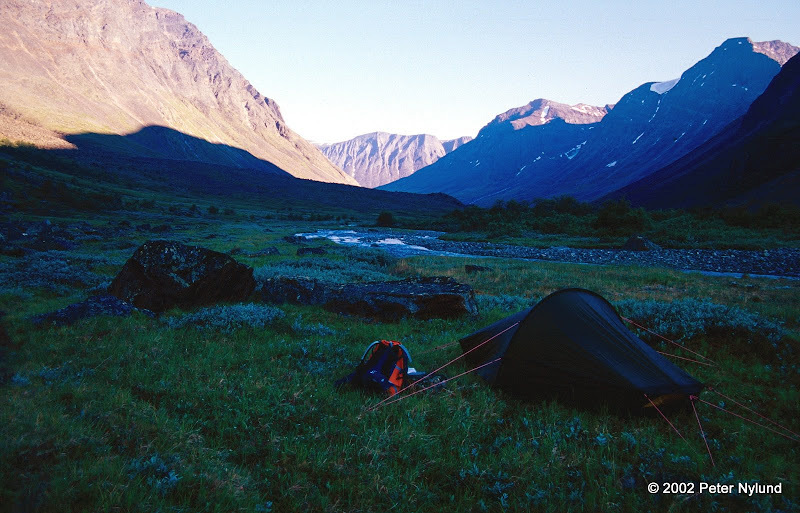 For a while I also had the Fjällräven Akka Endurance 4, a large 4-person tunnel tent with one ordinary and one extended vestibule. It provided plenty of room for three persons in a truly stormproof configuration. It was quite heavy and didn't see much use, since shortly after getting it I started the Vigu studies and was left with little time for own adventures. I sold it after having bought the Fjällräven Akka Dome 3 tent. 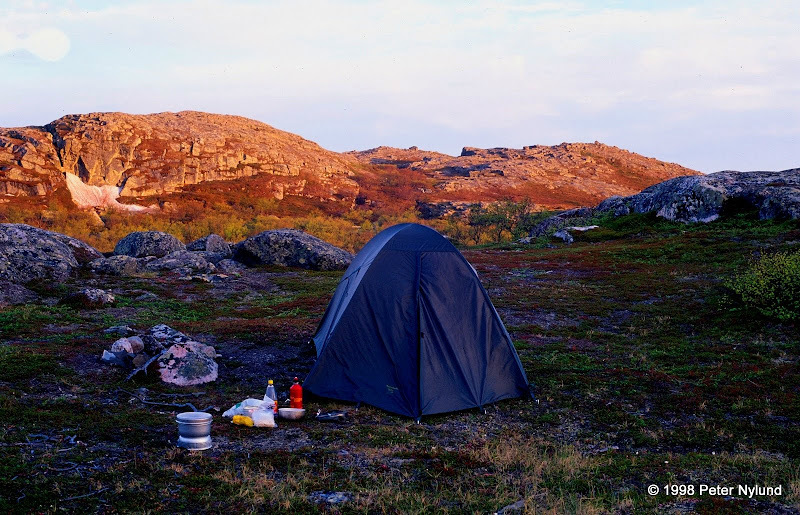 In 2015 I bought a Fjällräven Akka Dome 3 tent used from a Vigu buddy. Having started to do more kayaking, I wanted a freestanding tent, and this one just fit the bill. With a width of 180 cm it is 20 cm wider than typical 3-person tents, and thus actually fits three persons without problems. The ventilation is excellent with good possibilies to open and close vents. 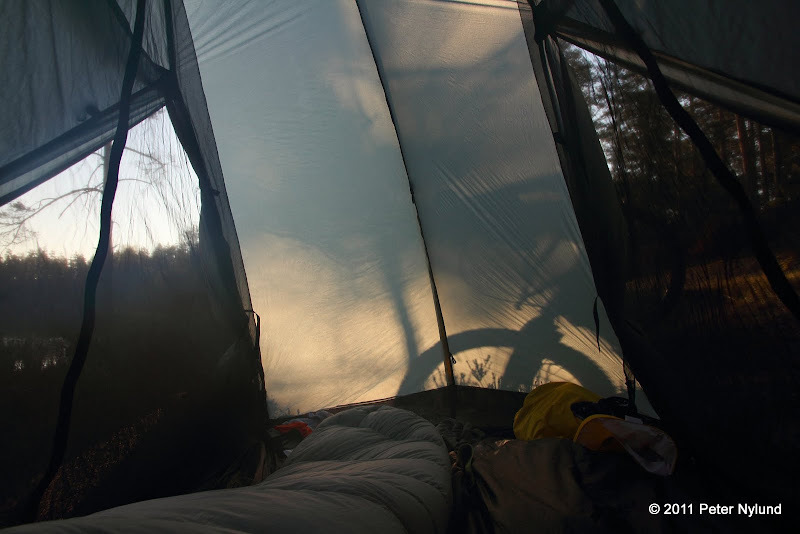 It is a four season tent, but can still be opened up to provide bug free views during the summer, something which I nowadays consider mandatory. I do basically like the idea of using a tarp, but in practice I've found them of quite limited use for overnighting. During the bug period, which generally lasts from the middle of May to the end of September I prefer a fairly open but still bug proof shelter such as the Tarptent Double Rainbow, since I think rigging up a separate bug nest under the tarp just isn't worth it. And during the winter a tarp just doesn't provide enough shelter in situations when a shelter is needed. 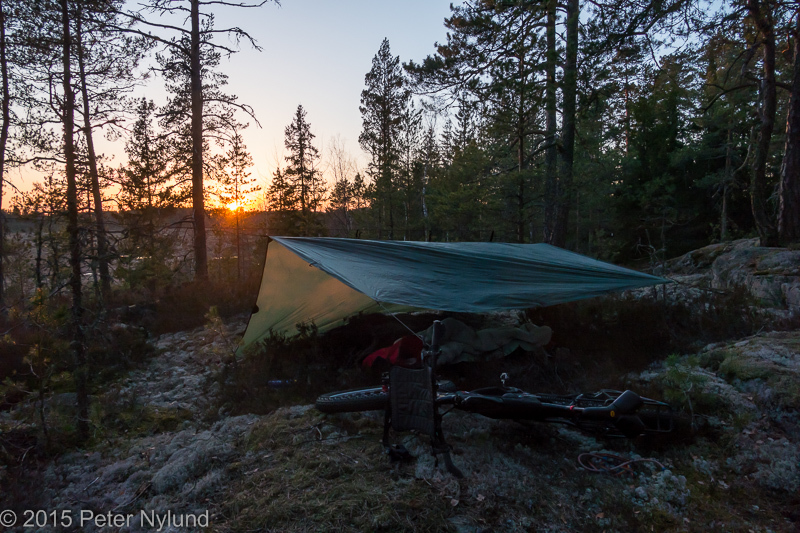 I originally had the Alpkit Rig 7 tarp, but found it a tad short when it rained with its 2.4 m x 2.8 m dimensions. The DD Superlight 2.9 m x 3.0 m tarp is long enough for me and also fits more than one person. A tarp does have other uses, though, and I generally bring one when kayaking. e.g. as a lunch shelter when it is raining. Finally, I'm quite fond of sleeping in a bivy bag outside the bug season and when there is low probability for precipitation. It really gets you closer to the surroundings. 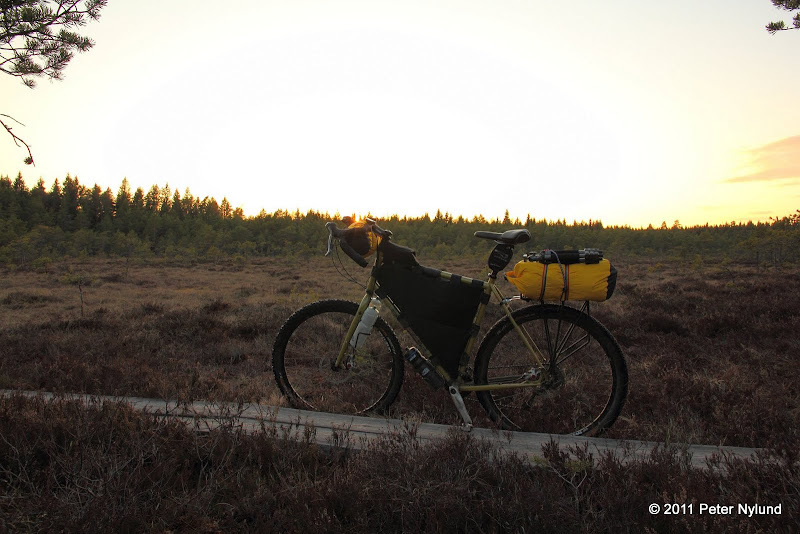 I use a cheap bivi bag from alpkit.com, which have been good enough. Finally the night temperatures seemed to stay clearly above freezing. It was time to go out with my kids, two boys aged six and seven. 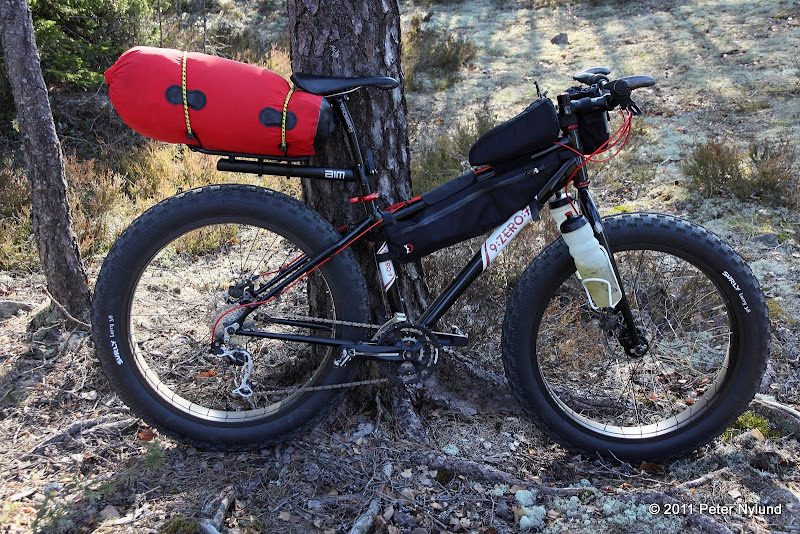 Bikepacking on trails is still a few years away for them, but backpacking is no problem. 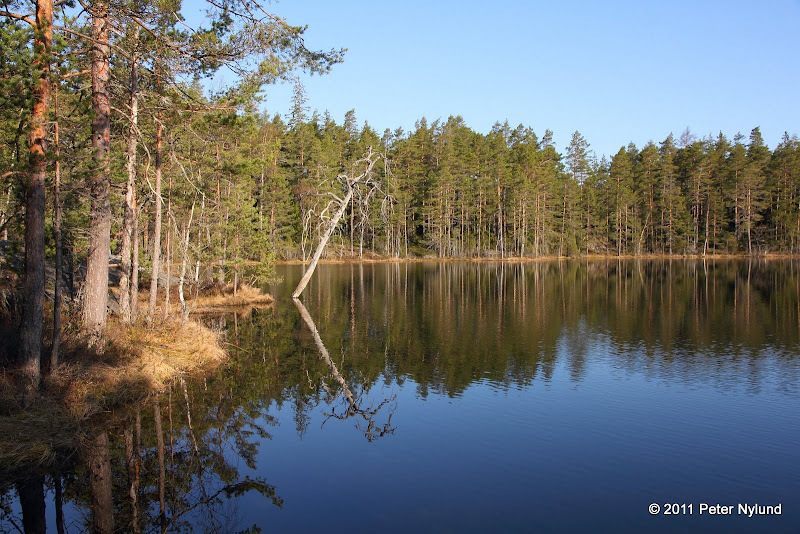 We got into the car and drove to Mathildedal in the Teijo area, a one hour drive. 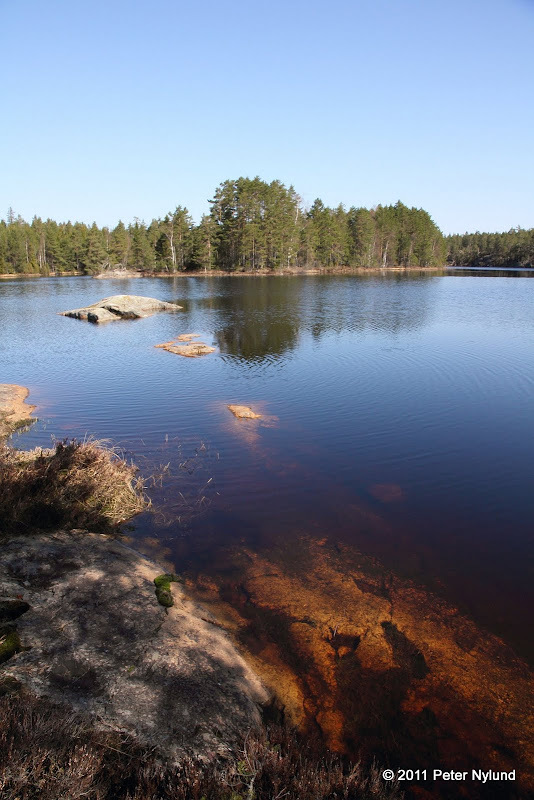 There would be other possibilities closer, but the Mathildedal trails go around two nice lakes and is quite scenic. Lots of interesting things to look at. ... and not always the easiest way. Bog-rosemary (fi suokukka, swe rosling). Our goal, the forest island to the right. The first task was to put up the tent. There was actually another small group at the shelter (usually I see nobody on my outings), but we found a nice tent spot a bit away. After that the kids went exploring the surroundings. We grilled a few sandwhiches over the fire started by the other group. Delicious! The evening was quite beautiful. Sunset at 22:15. Not bad. Time to sleep. There were already a few mosquitoes around, enough to warrant the bug inner tent. The kids did complain a little about the light, but soon fell asleep anyway. The night was full of bird sounds, and in the beginning some noise from the other group. 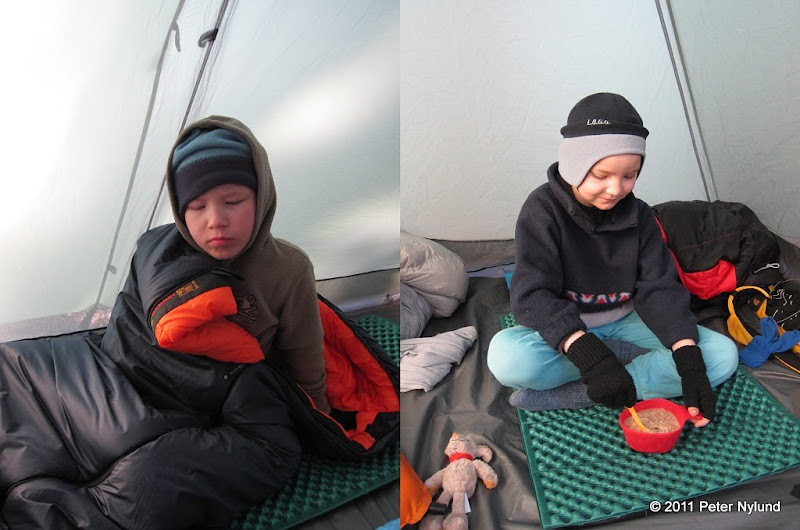 The temperature went a bit lower than expected, down to 3ºC (37ºF), but the kids said they were warm the entire time. Their sleeping bags should be good to around a little below freezing, but they seemed to glide off their half-length sleeping pads all the time, making it colder for them. 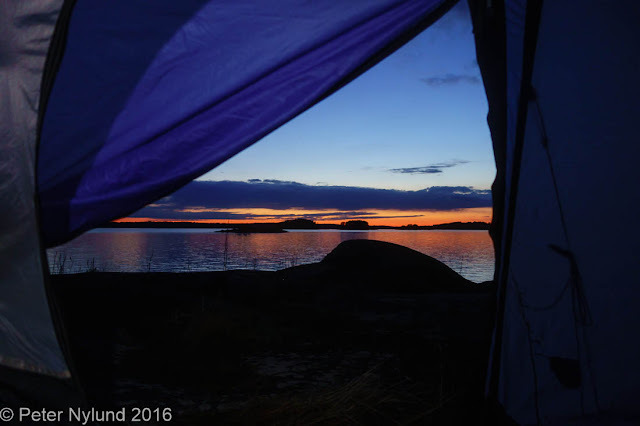 We slept long in the morning, and when we started to wake up the sun was already warming the tent to a comfortable temperature. We all ate porridge and drank hot chocolate / coffee. Morning exploring while I took down the tent. The kids carried their own sleeping bags and pads, while I took the rest. My 80 liter backpack weighing 1.8 kg wins me no credibility amongst the lightpacking crowd, but otherwise the gear was lightweight. I would probably get a new light backpack if I would do more backpacking. A modern 60 liter backpack should weigh clearly under 1 kg. Always something to take a closer look at. We arrived at the car after a one hour walk. The children were satisfied with the outing and immediately asked when we will do it again. I finished the video from last week's bikepacking trip. I have a special affection for the first part of the summer, and especially the time when spring turns to summer. After midsummer the summer is not the same anymore. 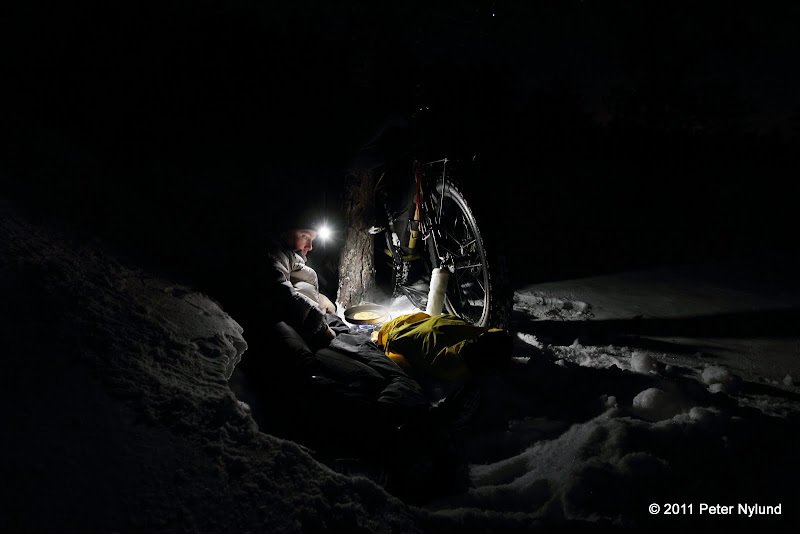 Using one of my leftover winter vacation days, I went for a two night bikepacking trip to enjoy the transition between spring and summer. 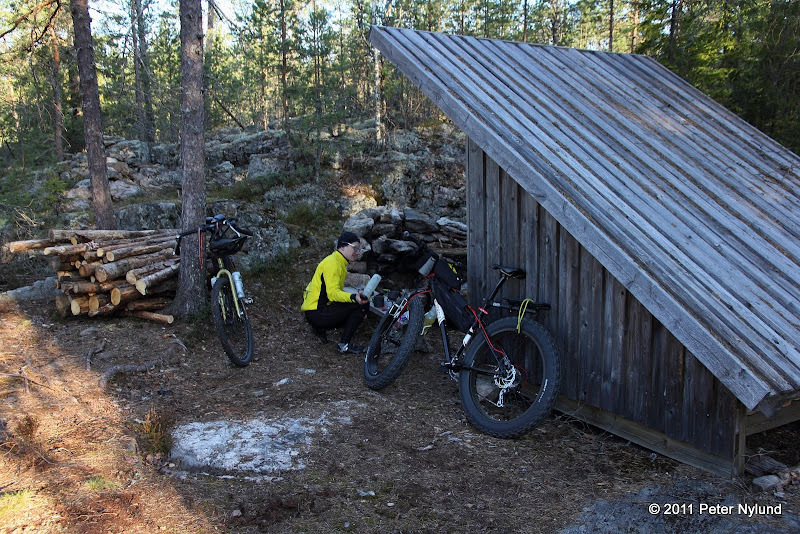 On Thursday evening I packed my Salsa Fargo and rode it to the train station and got on the train to Karis/Karjaa. It was a tight fit, but I managed to get the bike onto the bike holder system. The train arrived after one hour and I started riding. The first part was a disappointment. 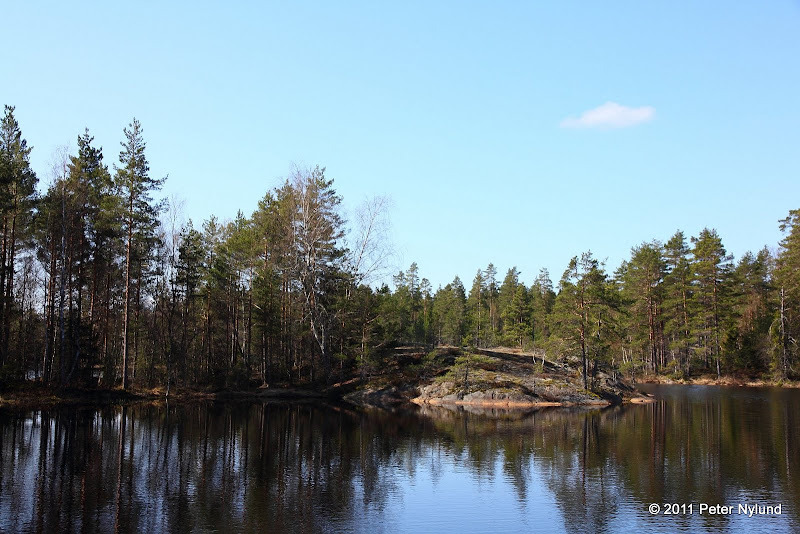 The trail along the Svedjaträsket lake had fallen victim to logging devastation and it took a while and some bushwacking to circumvent it and find a good route to the ridge running between Karis/Karjaa and Ekenäs/Tammisaari. 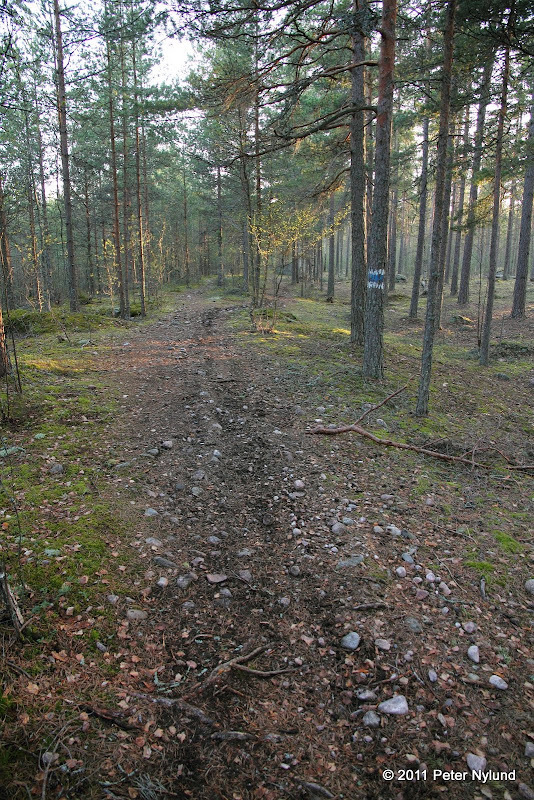 The ridge provides trails and small forest roads all the way to Ekenäs/Tammisaari. It was already getting colder and the wood anemones went to sleep. Training grounds for the local army garrison (as can be seen from the marking on the pine). I spent a lot of time here when I did my army time. After a while I arrived at the Västerby area. 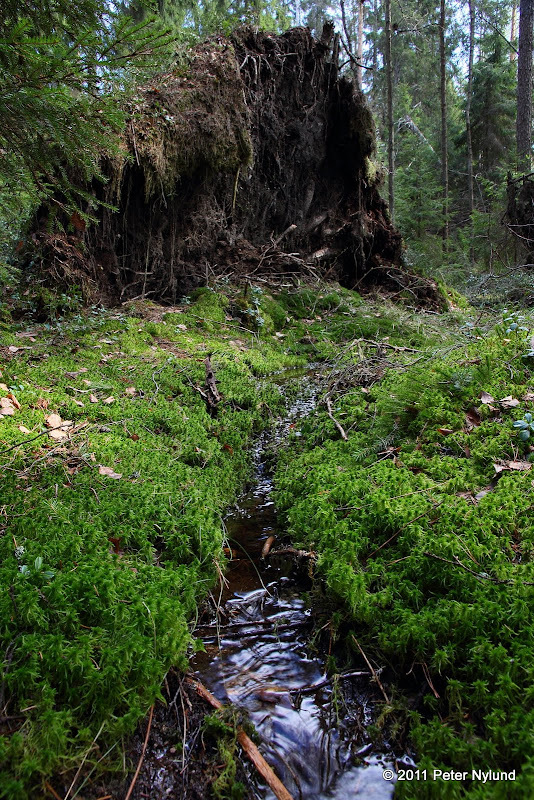 This place is just one kilometer from where I grew up. Sunset at Västerby Storträsket. 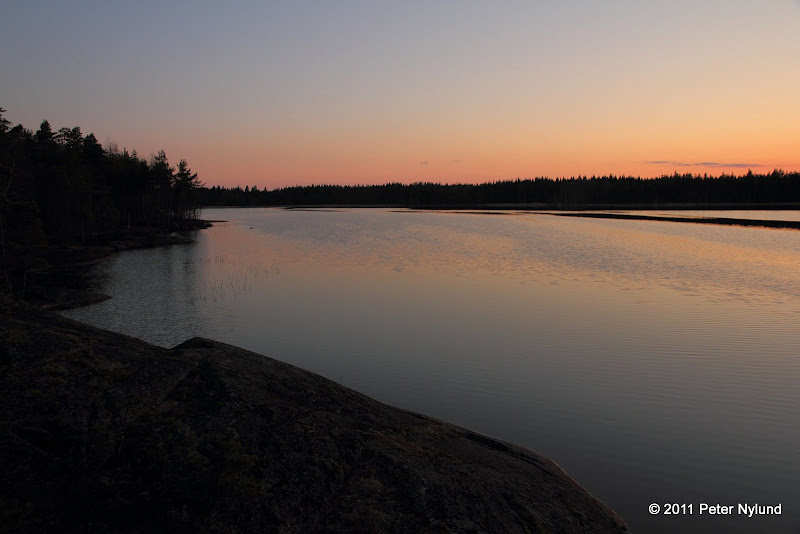 One of the nicest things about the summer is the light: The sun sets at 21:40. 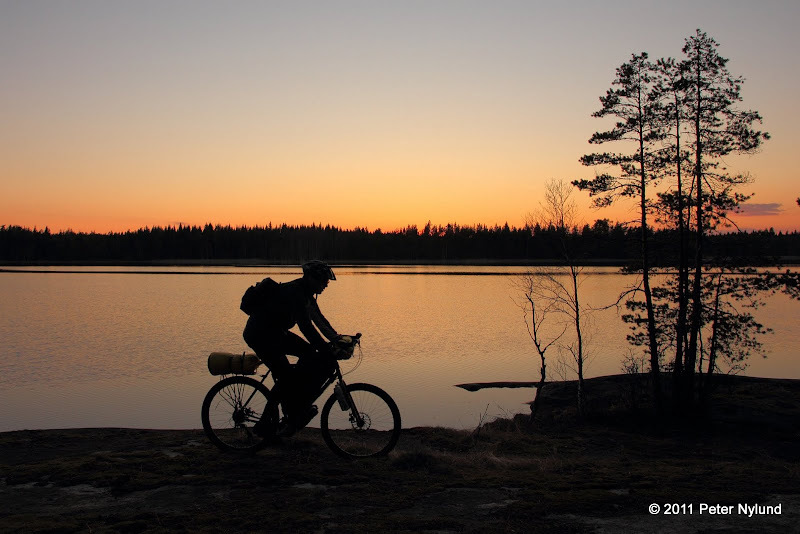 I continued for a while to the lake Vitsjön, just in time before it got too dark to ride. Todays numbers were 4 h and 42 km. I went to sleep around 23:00. The night was full of bird sounds. Especially the loon (Gavia arctica) sounds like wilderness to me. The night temperature was forecasted to go slightly below freezing, but I don't think it was that cold. I had some trouble with the sleeping pad gliding towards one corner of the tent, since the tent spot was not entirely flat. Maybe I should paint some silicon stripes on the tent floor as recommended by Henry Shires to make it less skiddy. After sleeping fairly well I got up a little over seven in the morning. The tent spot was chosen for the morning sun and I took my time enjoying the morning. It was still fairly cold in the air and a piece of gear that would come in handy in these situations is a light summer down jacket. Something on my list of gear to get. 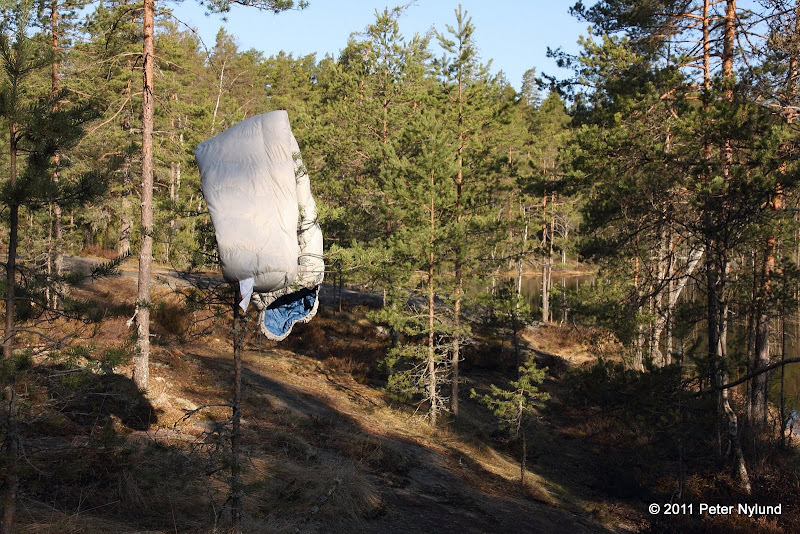 Airing out the down sleeping bag, a North Face Beeline 900. A good piece of equipment. It weighs just under 600 g i XL size and keeps me warm until just below freezing. 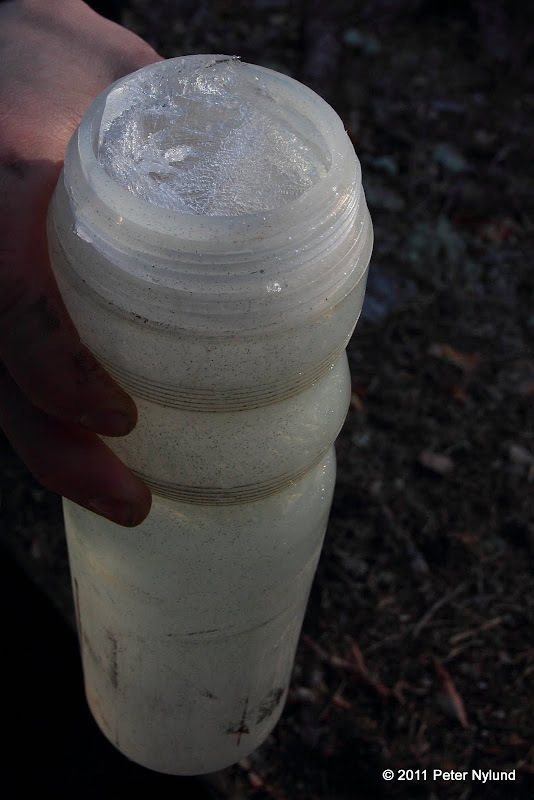 Filtering drinking water. 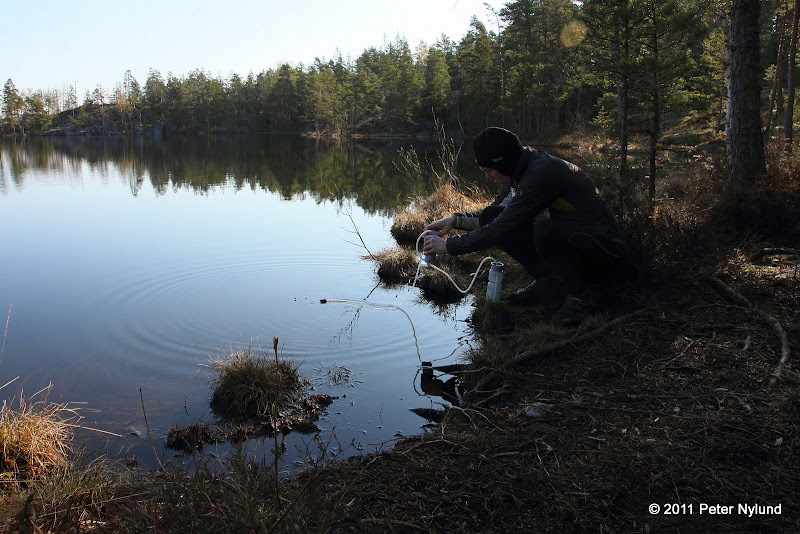 This particular lake is crystal clear and oligotroph, so the risk of getting sick drinking this water is very low, but since I had the water purifier with me I used it anyway. On the move again, riding the trails of the Västerby area. 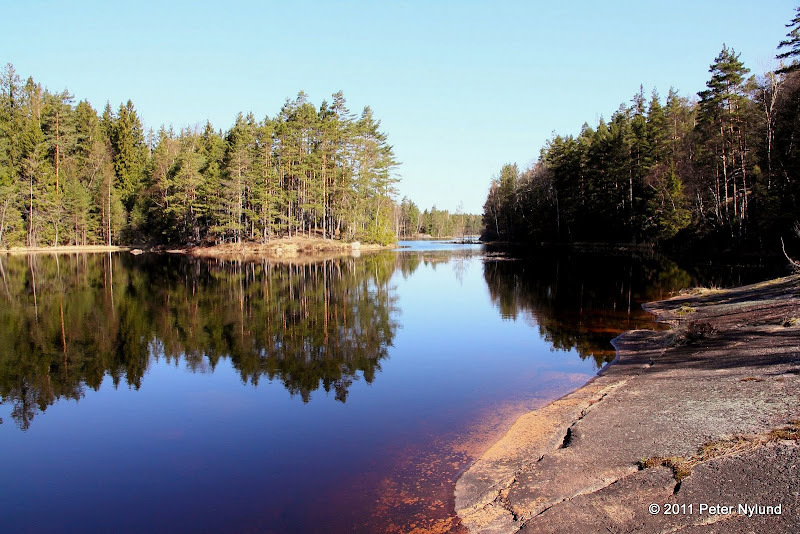 Grabbskog Storträsk, another beautiful lake. Bypassing a trail section destroyed by logging work. 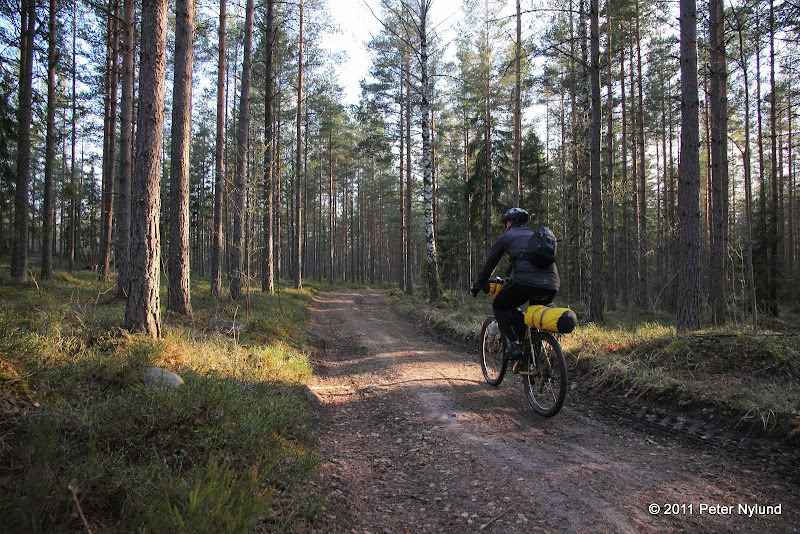 I spent three hours on the Västerby trails. Most of them were familiar to me, but I also found some new ones that were not there twenty years ago. 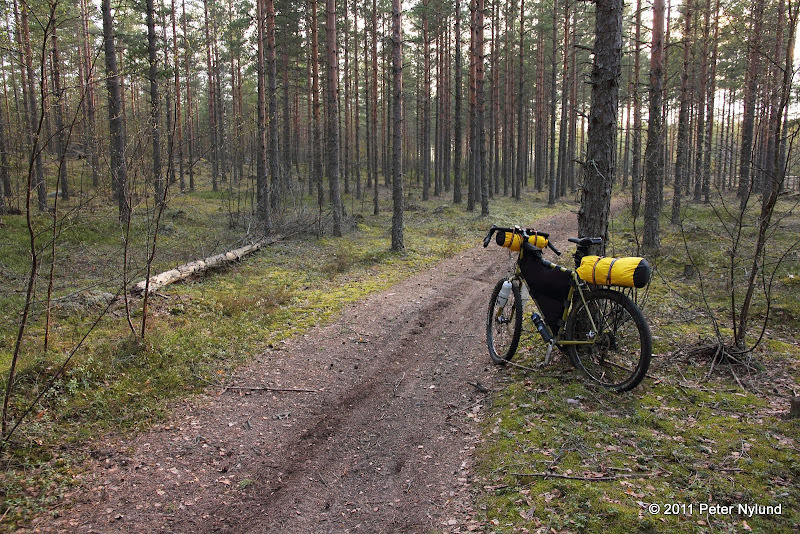 After this I had a section on roads ahead of me to get to the Teijo area. 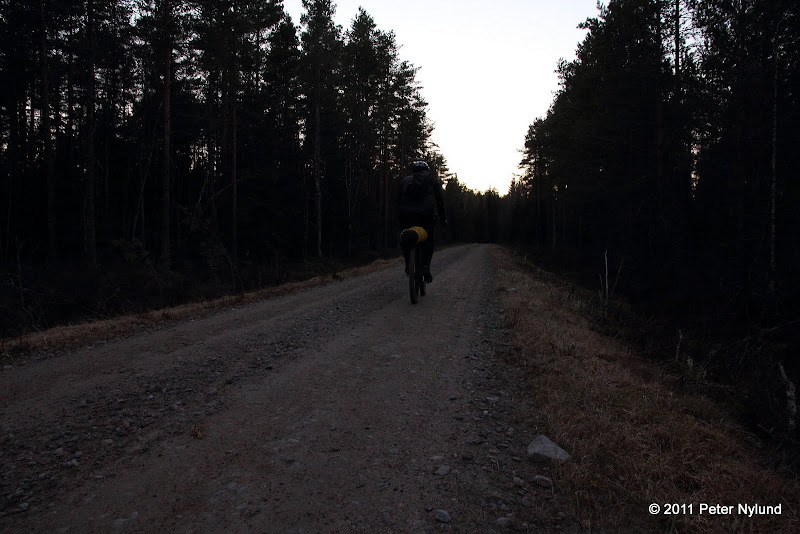 About 45 km of mostly smaller forest roads, but also some asphalt.It took me almost 2.5 h, including a short break. Arriving at Matildedal in the Teijo area. In the middle of the day the wood anemones are awake. 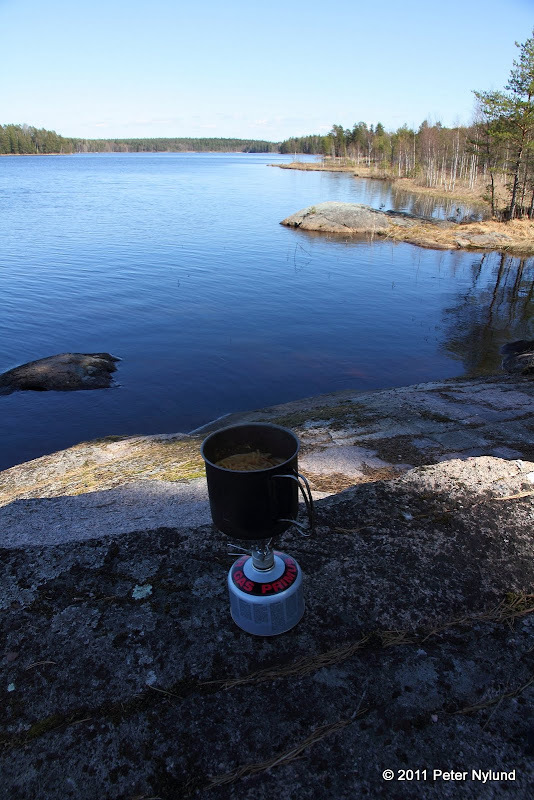 A late lunch at Puolakkajärvi. Creme de Paris. 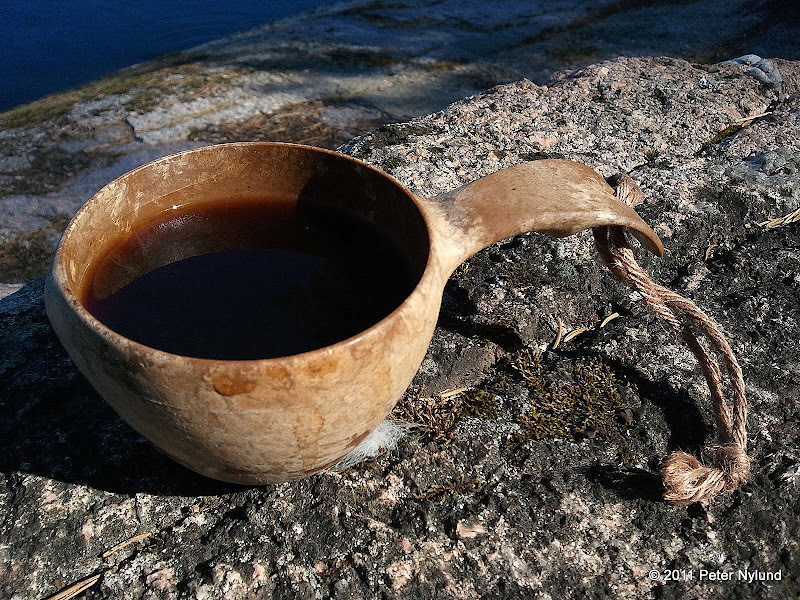 And the Kupilka kuksa is nice, too. 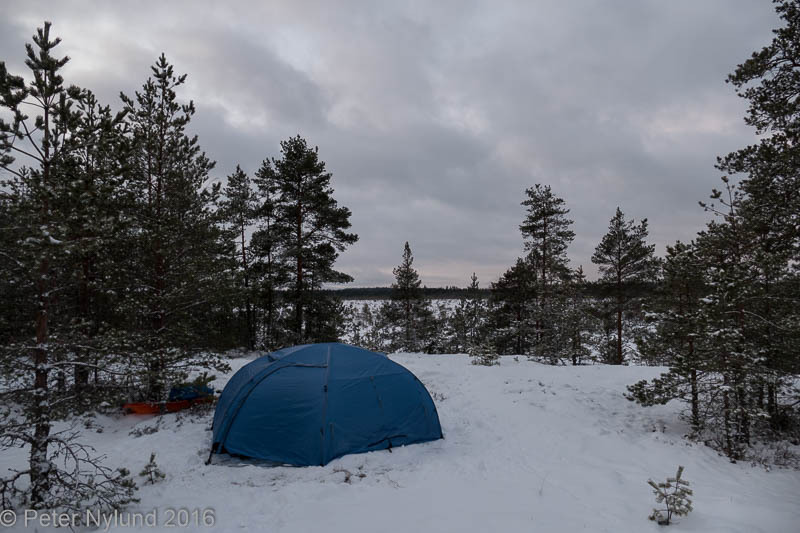 After lunch, coffee and a little nap I continued through the Teijo area towards Salo. There are still shaded places were the spring has just begun. Coldsfoot and snow. I even came upon an official bike route. 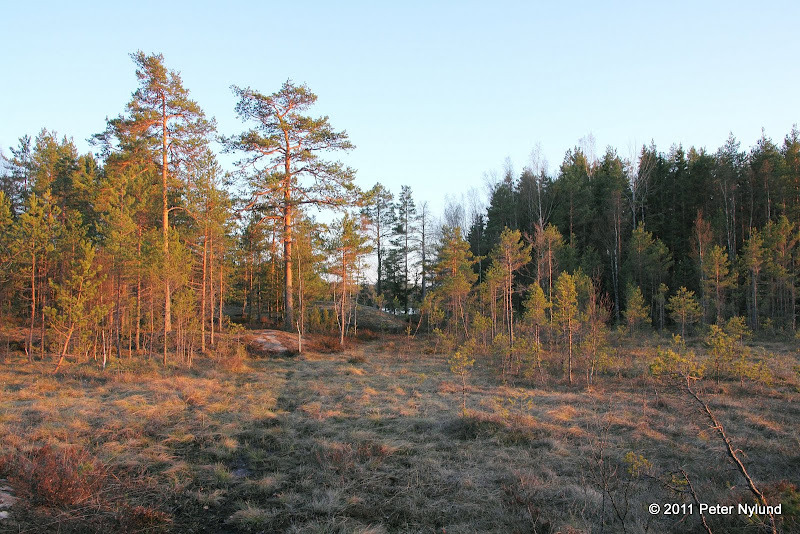 Leaving the Teijo area to get to the Marttila area to meet Toni Lund. Ahead of me was a few hours of mostly different kinds of roads. The ride turned out to be a race against darkness. I was getting a little tired and also took a wrong turn that cost me half an hour. 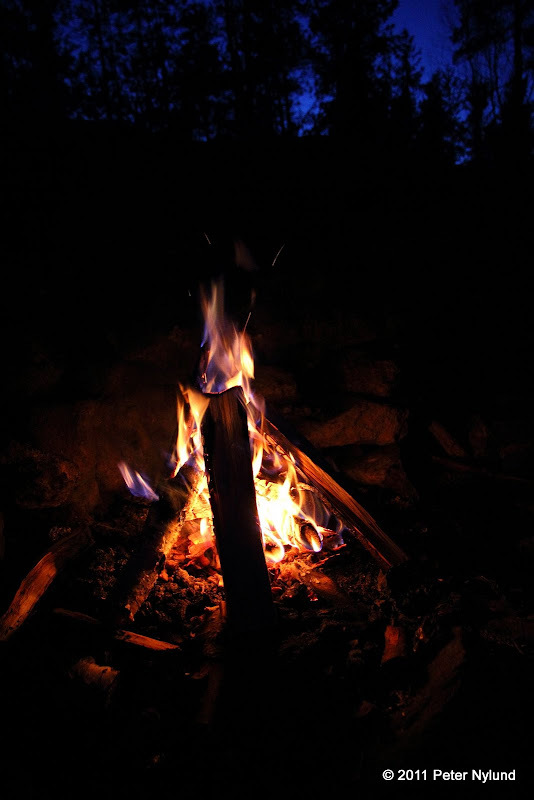 I arrived at the Karhumäki shelter around 22:00 and started a fire. A short while later Toni arrived as well. The shelter itself was more a firewood storage, but had enough place for Toni. I put up my tent. Today I rode 138 km and spent 10-11 h actually riding or pushing the bike. At this point I was very tired and low on energy. I was having a hard time getting any food down. The following Twitter message, complete with errors, show the state I was in: Met with @Toni.Lind om Marttila. Very tired, going to sleep now. I went to sleep at midnight. 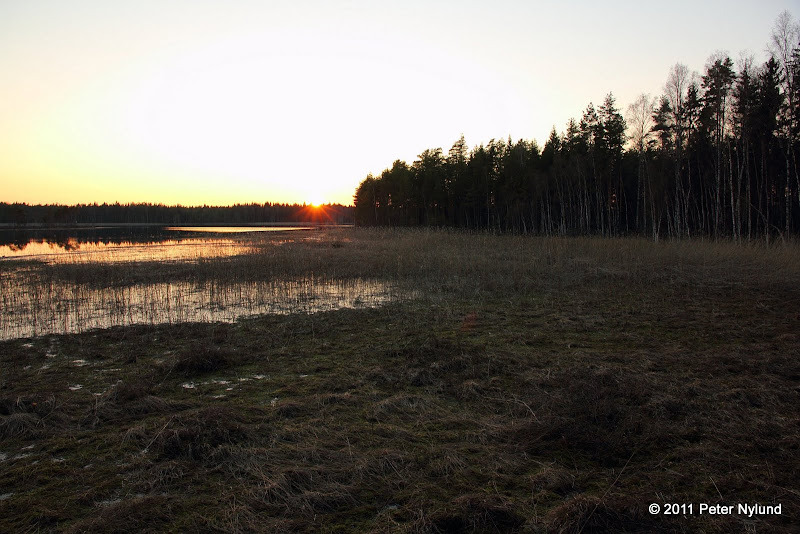 If not for meeting with Toni, I would probably have stayed in the Teijo area for the night, since this way the day was a bit too long. A good nights sleep made me feel a lot better and I started to wake up at 7:20. This time the night temperature went below freezing. My Tarptent Double Rainbow, a really nice shelter. Lots of space for one person and bought to be big enough for me and one child. It weighs 1.2 kg, which I find acceptable, though a pure ultralight solo shelter would weigh less than half of it. 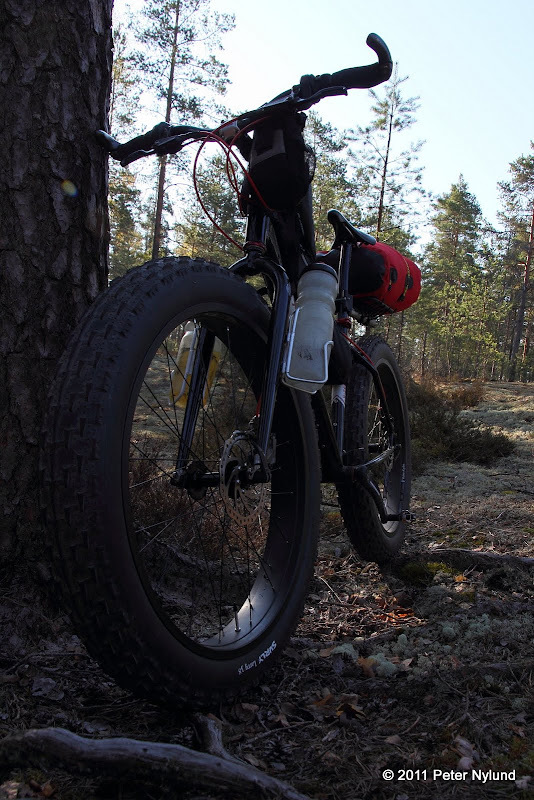 Toni's new fatbike is extremely nice. We only had time to ride some short trails sections before turning back home. Ahead of me was around 60 km of road riding. I got home just in time for lunch with the family, after around 60 km and 3.5 h of riding. A nice little trip again, and thanks to Toni for joining me.